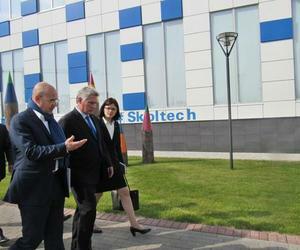 The first Cuban vice president Miguel Diaz-Canel, knew in Moscow about the strategy of the Development and Commercialization Fund of new technologies of Skolkovo, during a tour of its facilities, reported PL Agency. Victor Vekselberg, head of the nonprofit organization created by the Russian government in September 2010, showed the visiting leader and his accompanying delegation the projects that aim to accelerate the transformation of Russia from supplier of hydrocarbons –mainly- to an economy based on innovation. The First VP visited some facilities of the project that by 2020 will occupy two million square meters of residential and industrial areas, where 35 thousand people will devote themselves to innovation. Alexandr Kuleshov, rector of the Skolkovo Institute of Technology (Skoltech), explained the Cuban leader that this center of teaching and research only trains specialists in the post-graduate level.